This second experiment was a bit of an adventure, too. 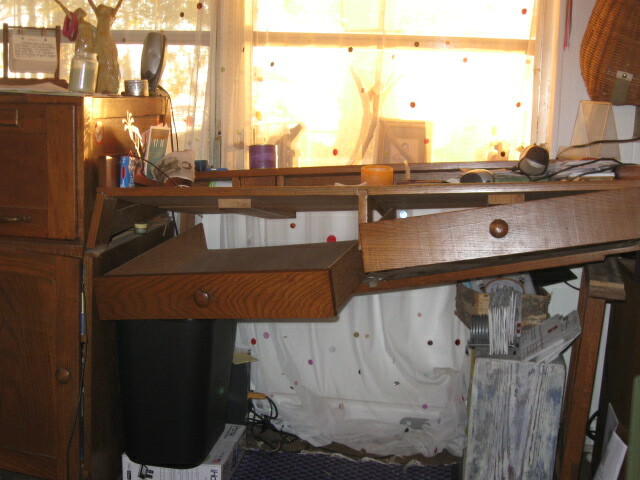 My desk broke. I was right there, stapling some paperwork and it just collapsed. Lots of stuff hit the floor. The desk hit my lap. No fun. I love this desk. My friend Roy made it and gave it to me several years ago. It’s served me well. I was bummed. And then I was encouraged. Now, I’m not a carpenter. I don’t even play one on TV. I KNOW carpenters – gifted carpenters. I just had to try fixing this myself though. It wasn’t about being stubborn. It was about honoring this object that had served me so well. So after having a cup of fresh coffee and catching my breath, I made a plan. And then I went at it. Fixing my desk became about so much more than a carpentry experiment. 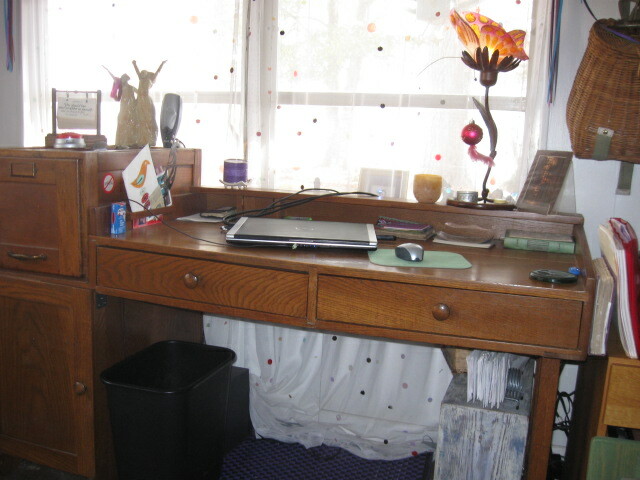 The process turned into an experiment in how I REALLY want my workspace to BE. I want it to be basic. I want what’s most important to be what’s in front of me. I want what’s not important to me to weigh me (or my desk) down. So I created what I wanted. I’m even happier with my desk than I was before. And I think my desk is happier, too. It’s cool how brokenness teaches us about what’s really important. What has brokenness taught you lately? Pretty much the same thing you learned from your desk…. I need to remove the garbage and unwanted/unneeded clutter from my life. Removing the clutter of many years is not easy, but in order for me to move forward in my new life as a single person after 22 years of marriage and 26.5 years with the same man, I am going through all my stuff and dealing with what needs to be sent forward to a new life so I can move forward with my new beginning. And I will be moving forward lighter and brighter just like your desk! I have a wonderful husband who is quite handy and happier if he is doing something. I am very spoiled. I wouldn’t know where to begin to fix your desk. I had a kitchen sink faucet become leaky late last year. Kitchen faucets (with a hand-held spray attachment) don’t come cheap and neither do plumbers and I’ve been irritated lately with the disposable nature of so much of what we buy, so I decided to try to fix it myself. I found great videos on YouTube telling me how to fix my type of faucet. I started to dismantle it and then ran into my proverbial “frozen bolt”. That’s the thing in most projects that you don’t expect that makes them take twice as long as you expect them to take. In spite of my determination to fix it rather than replace it, the faucet was made with parts that broke when I got a little rough in the disassembling process. So built-in obsolescence won that round. But, still on my do-it-yourself trip, I researched replacements that were available at my local home supply store and was able to put a new one in at a reasonable price all by myself. So I understand what you mean by being happier with the object than I was with the original. I love doing dishes, cleaning my sink, anything that allows me to use the faucet that I installed myself with inadequate tools on a day when I “needed” to be doing other things. It’s less about the things we have than the experiences we build and the memories we make. Thanks Lisa. As always, you touch my heart. oooooooo Valli, i’ll celebrate you and your (very successful) experiment every time i use my own kitchen faucet. THANKS & LOUD cheers! I won’t go into details, but something with one of my children has recently broken my heart, or at least cracked it a bit. Upon reflection, prompted my your email, I guess I had to put that crack in my heart to learn to “let go” yet a little more of my grown child, and let him find his own way. It’s so hard to love so fiercely; but even a mother bear eventually lets go. I must have faith that my cubs will find their way through the wilderness!